Wooden Camera's RED ONE Pro Kit is a 19mm rod support package designed specifically for the RED ONE camera. It includes a bridge plate that features an ARRI-style dovetail interface and supports a pair of 12"-long 19mm rods at the correct lens height for use with industry-standard accessories such as follow focuses and matte boxes. For tripod mounting, a 12" dovetail plate is included, providing the extra length needed to help you properly balance your rig. 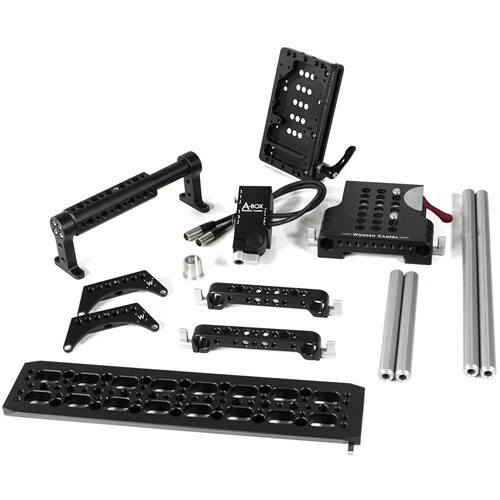 In addition to the bridge plate and dovetail, the kit outfits the RED ONE with an extended top handle that features 1/4"-20 and 3/8"-16 accessory threads, and a 19mm rod assembly that adds 6"-long rods at the top rear of the camera. These rods are used support an included A-Box XLR to mini XLR audio adapter and a battery slide that accepts optional V-Mount or Gold Mount battery plates. Please see the links below for more information on the components of this kit. The Top Mount (Red One) from Wooden Camera provides rows of 1/4"-20 holes in RED standard spacing allowing Rod Clamps, Handles, Battery Mounts, Safety NATO Rails, UVF Mount, and more to be attached. Additional 3/8"-16 holes are included on top center. The Wooden Camera 146300 Cheese Handle with Extension is a length-adjustable handle for RED Epic and Scarlet cameras. When combined together, the top handle (cheese) and the extension allow for any combination of modules to be securely bolted together by four screws. This handle and extension unit comes with four 1/4-20 x 3/8" screws. The Wooden Camera WC-150300 Rod Clamp (19mm) is a versatile, compact, and lightweight unit. It can be attached to existing 0.74" (19mm) studio rods to provide 1/4-20 and 3/8-16 mounting points. This rod clamp can also be turned over and bolted to cheeseplates, cages, and battery plates. The Battery Slide from Wooden Camera is an adjustable mounting system for V-Mount, Gold Mount, QRC Gold Mount, and RED/BLUESHAPE battery plates. Multiple rows of pass-through holes allow the attachment of rod clamps, cheese plates, and other accessories. In order to adjust the plate's position, the user only needs to apply firm pressure to tilt it into place. Sliding the plate into position is facilitated by an adjustable thumbscrew. Both these movements make the plate ideal for adjusting counterbalance and transitioning from studio to handheld position. The Wooden Camera A-Box for Red One adapts industry standard balanced XLR male plugs to mini-XLR balanced plugs (female). The A-Box gives you more options in what kind of audio devices you can connect to your Red One Camera. The A-Box also comes with a bolt-on 19mm rod for attaching to any 1/4-20 threaded hole. Box Dimensions (LxWxH) 5.0 x 2.0 x 0.7"
Box Dimensions (LxWxH) 6.1 x 4.3 x 1.3"
Box Dimensions (LxWxH) 6.0 x 2.0 x 1.0"
Box Dimensions (LxWxH) 8.7 x 6.4 x 2.3"
Box Dimensions (LxWxH) 7.7 x 4.3 x 2.3"